The Electoral Reform Society published a report a couple of days ago on the number of female MPs likely to be in the next parliament. It concluded that we could be about to see a record number of women elected: 192 in total, up from the 148 currently in the House of Commons. This would represent 29.5% of all MPs, up from 22.8%, and would see the UK move from 56th to 36th in the world rankings for female parliamentary representation. The ERS also projected that the region of England best represented by women in the next parliament will be the north-east (41.4% of the total MPs) and the worst will be the east of England (19.0%). They used a polling projection that puts Labour on 31.5% and the Conservatives on 33.6%: somewhat adrift from the current averages, but not outside the margin of error. They added that were Labour to win 35% of the vote and the Tories 30%, female representation would go up to 31.7%. If those two shares were reversed, representation would go down to 28.2%. But either way the proportion seems set to go up by at least 5%: something that would mark a sharp increase on the historical trend. There was no real take-off until the late 1980s, with a massive surge in 1997 followed by a plateau then another small rise. 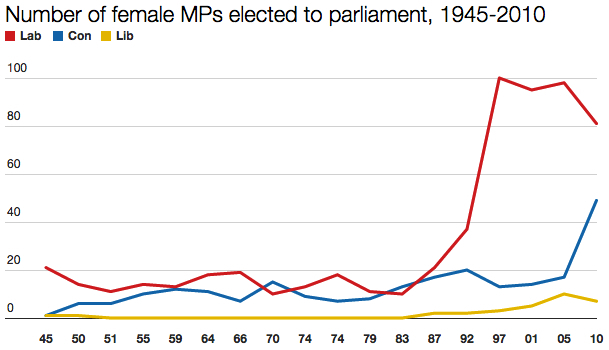 Labour returned 21 women to parliament in 1945 but didn’t match this figure again until 1987. 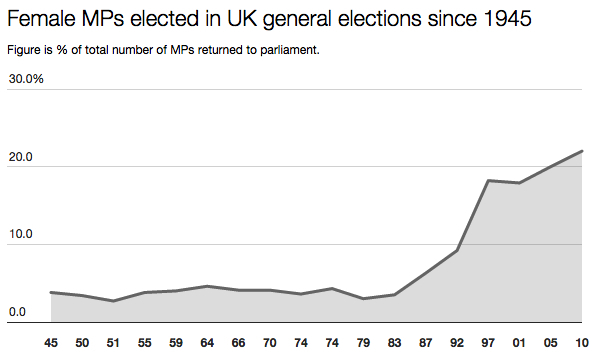 The Tories didn’t make it above 21 until the 2010 general election. The ERS forecast that 59 female Tory MPs will be elected this May, while Labour is on 114. The Lib Dems will return just one. The report doesn’t say exactly who this is, but I suspect it would be Lisa Smart, who is hoping to succeed Andrew Stunell as Lib Dem MP for the safe-ish seat of Hazel Grove. Meanwhile I’m not sure when the ERS compiled their calculations, but as of Friday night their figure for the number of female MPs in the next parliament has almost certainly increased by one. I am sure most people would agree there should more women in parliament and on merit of course. 1. Of those voted, percentage men and percentage women? 2. Turnout amongst men and turnout amongst women please? Apparently, in Rwanda, 63.8% of the lower house of the legislature are women (51 out of 80). In Bolivia, it is 69 out of 130 (53.1%). Andorra has exactly half. There are only 25 countries with more than a third women! At a shade below 25%, the UK is in 56th place. Generally, the turnout for women is slightly (1 percentage point or so) above that for men.